I'm no stranger to being THAT neighbor. You know exactly the one I'm talking about. The one the rest of the neighborhood is slightly scared of because they truly wonder if everything okay there. If you don't know what I'm talking about, well, I'll break it to you gently: then you're THAT neighbor. I own my THAT neighbor status. 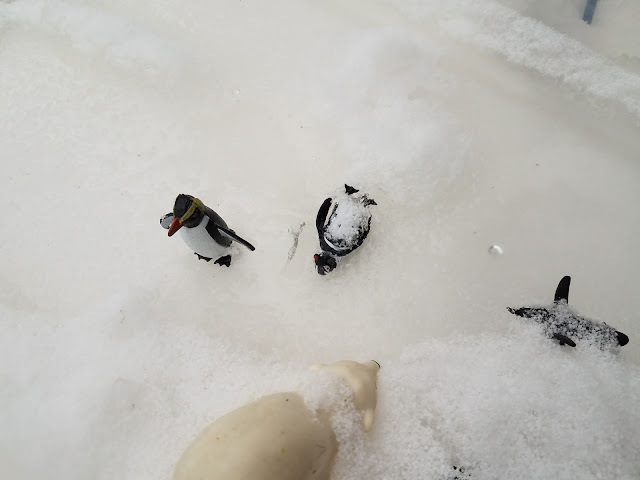 I found it especially amusing one morning last week as I stood on my front porch, with six little faces watching me out the window (and licking the window in the process), in my flip flops scooping freshly fallen snow into a long Sterilite container. A neighbor walking out of his house, watched me for a few seconds, then proceeded to avoid any eye contact with me. I'm sure it didn't help that I was singing and talking to the kids through the window as I did this. Thinking about it now, said neighbor may not have seen the kids in the window from where he was so it may have seemed I was singing and talking to myself. I proceeded to really go for THAT neighbor status when I began jumping for the icicles hanging from our gutters (I also nearly slipped on the ice when landing once or twice which I'm sure just added to the whole scene). Our neighbor promptly went inside his house and shut his door the minute I started jumping. I can imagine the conversation he had with his wife, "she's now out there jumping for icicles. What could she possibly be doing?" 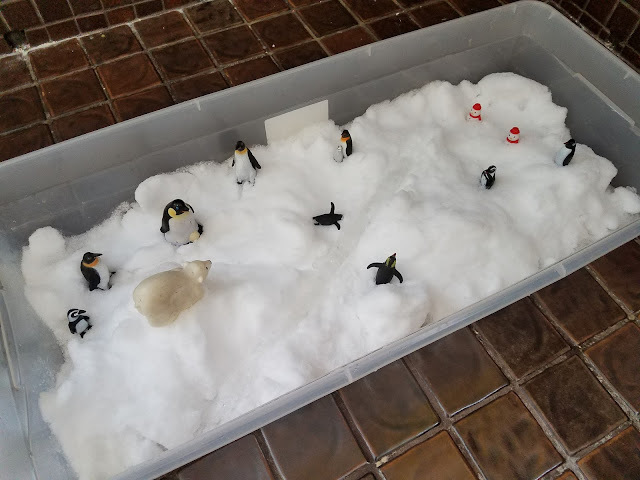 Well sir, I was making the latest sensory bin for daycare (duh). It's been a while since we've had measurable snow here in Des Moines and we took full advantage last week. 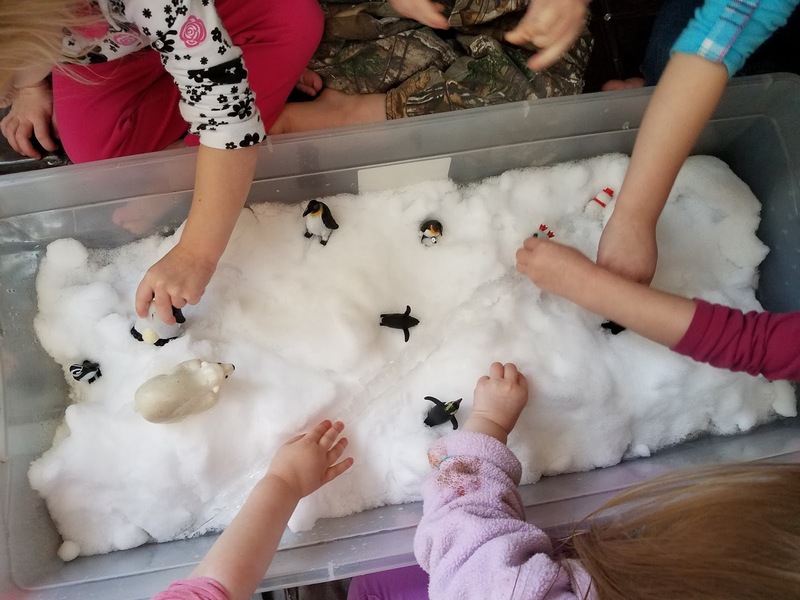 With so many littles we rarely make it outside during the winter months (think about how long it would take to get them all bundled up) so the snow comes into us. 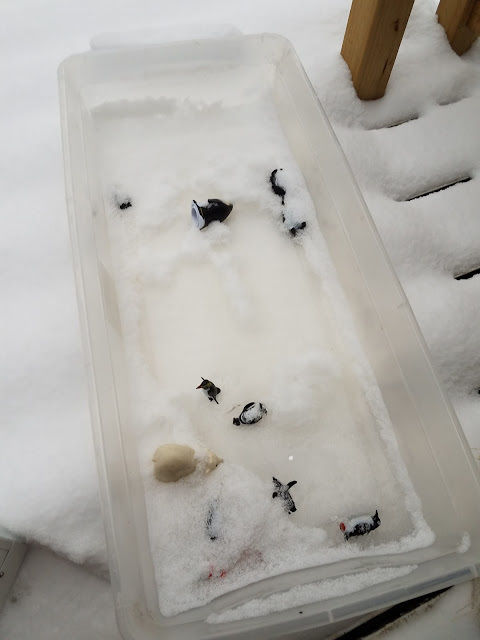 I piled the snow in the bin and added figurines: snowmen, penguins, a polar bear, a seal and a few scoopers. I had extra pairs of gloves they could wear to play (although no one wanted them on). We stuck the bin outside during naps and let the water freeze! 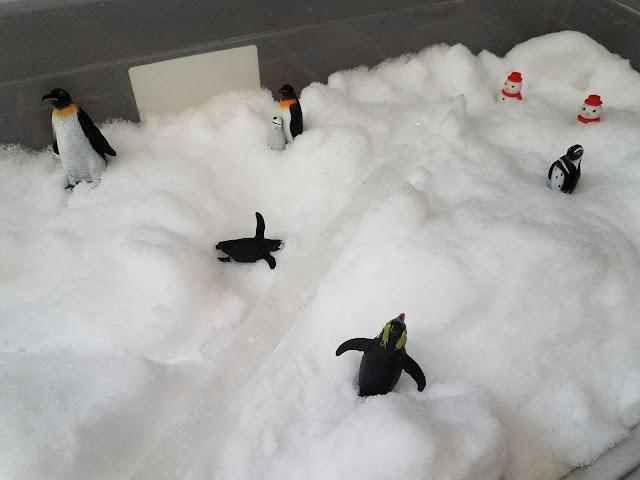 Then it was a "freezy icy" sensory bin. Not only did we have a fun (and extremely easy if you live in areas that get snow) sensory bin, but they got a science lesson too. The penguins were "caught in the icy!" (as the kiddos said). Their favorite part was breaking them out of the ice as it slowly melted. 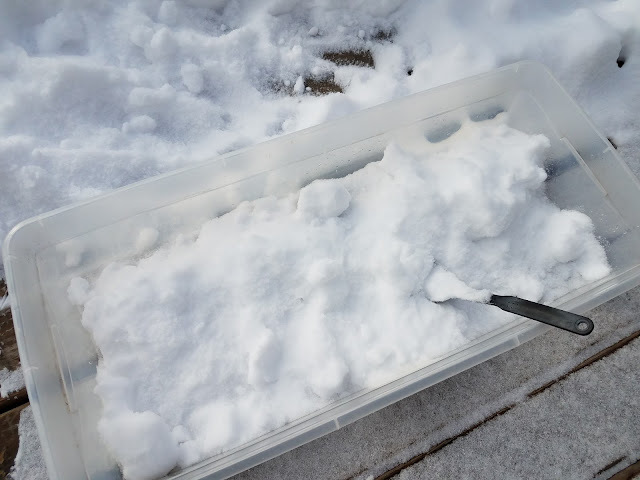 The best part of this bin is that we still have it sitting out in the cold, re-freezing, so we can play with it later in the week! There are a few perks to winter weather.